It’s pomegranate season! I live in a suburb in Sydney that has a lot of backyard pomegranate trees, so even though I buy my pomegranates from a boring old shop, I can still see fruit-laden pomegranate trees and feel connected to the seasons – a rare and magical thing for a city dweller in this day and age. When the pomegranates are ‘on’, I like to add them to salads, use them for a garnish for rice pilaf or with whatever can use a crunchy, juicy, slightly sweet garnish. A simple salad of watercress, feta and pomegranate seeds dressed with balsamic vinegar and olive oil is probably one of the most awesome things I have ever eaten in my life. About a month ago on a particularly hot and humid night in February, my niece and I were looking through the Kepos Street Kitchen cookbook, Falafel for Breakfast, when we came across the section on mocktails, including this pomegranate mojito. In the middle of a record breaking heatwave, it felt like the only the thing that could possibly revive and refresh us was a pomegranate mojito. Along with all the mocktails featured, this mojito was made with a muddler, something I had never heard of. A quick Google revealed a ‘muddler’ is a pestle used by bartenders to muddle or gently mash herbs and fruit for cocktails. The trick with muddling is to not over-muddle your herbs (such as mint), as this will release the bitterness in the leaves. After a bit of effort, I tracked down a muddler from House. As you can see from the picture above, my muddler has the smooth ended pestle, which is good for gently bruising herbs, and a rough, pointy end to use on lime or lemon quarters and other fruits to crush out the juice. I don’t really need more kitchen gadgets and utensils but I’ll admit I love my muddler, particularly this muddler with its versatile fruit crushing end. Now, instead of juicing limes for a lime rickey or iced tea, I can just crush the fruit in the glass before adding the liquid. Over the long and hot February, I starting making a larger batches of sugar syrup and keeping it in the fridge for when the need for a lime rickey or other fruity mocktail struck. When it’s really hot and humid, a nice mocktail just before you start making dinner really hits the spot. Note: I was racing against the clock to photograph these pomegranate mojitos and the pomegranate and lime are not that well muddled. I did think about re-photographing them but it was like yeah-nah, they still look pretty, just not muddled enough. 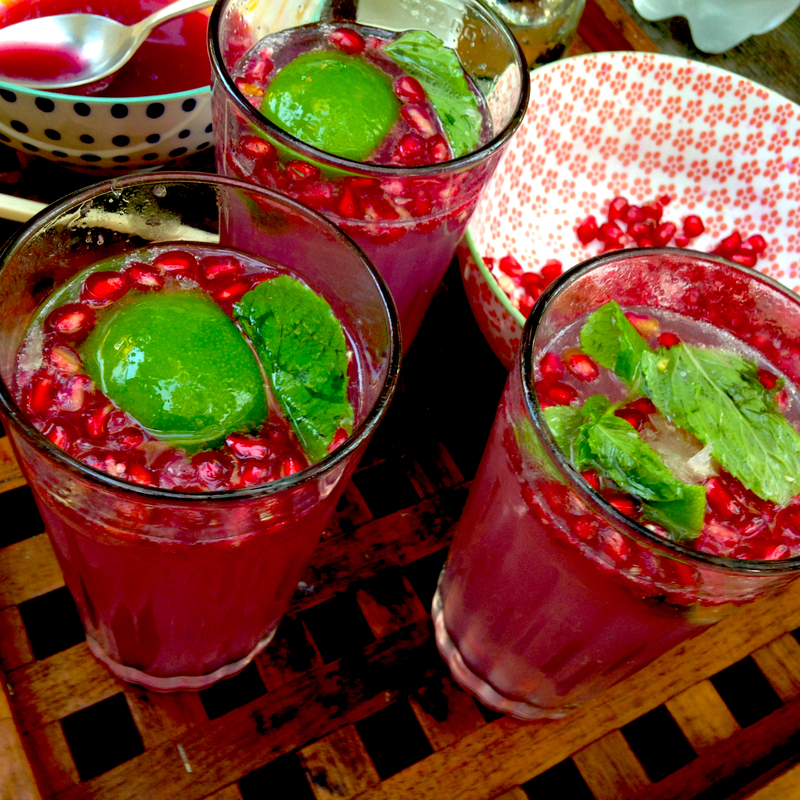 extra mint leaves and pomegranate seeds to garnish. Place 2 lime quarters, 2 teaspoons of pomegranate seeds, 1 tablespoon sugar syrup, a mint leaf in the bottom of four sturdy glasses. 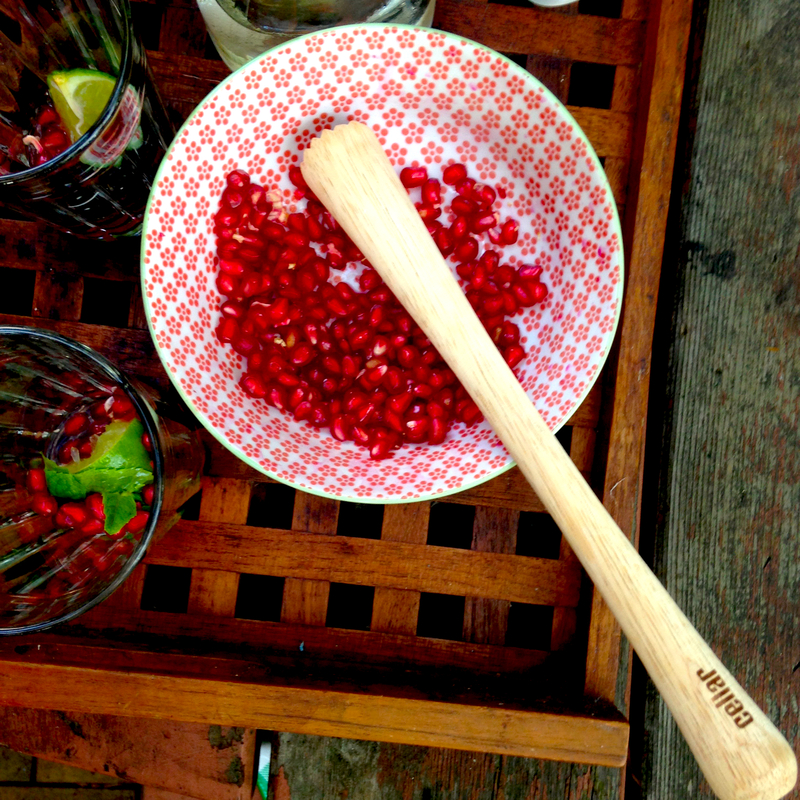 Crush lime and pomegranate seeds with the muddler stick. The mint leaf should be just gently bruised to release the minty scent and essential oils but not pulverised and shredded. Add soda water, crushed ice and stir. 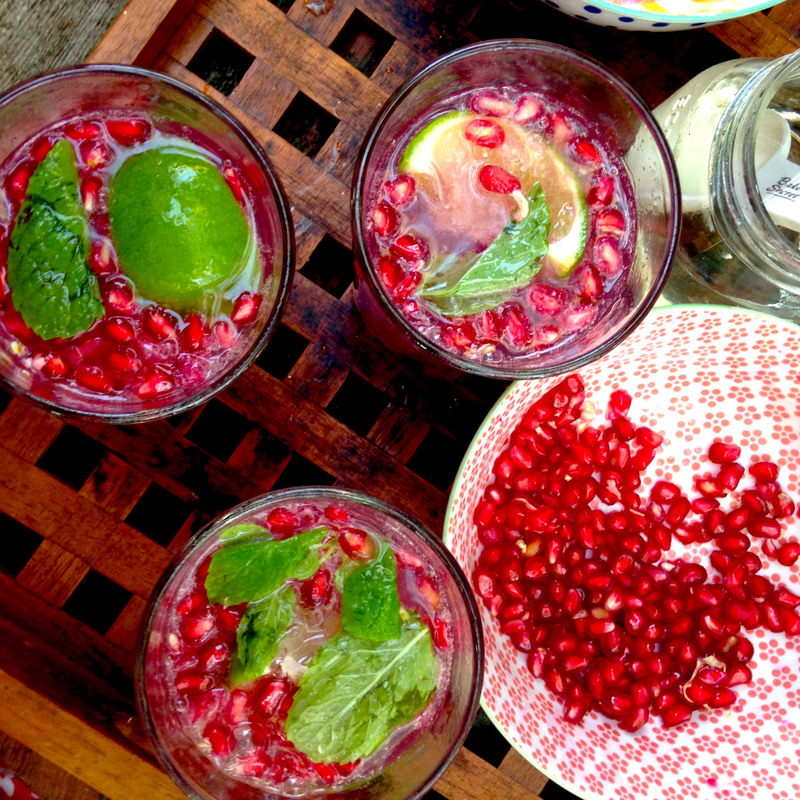 Garnish with extra mint leaves and pomegranate seeds. Note 1: Heat 1 cup of sugar and 1 cup of water, heat in a small saucepan until sugar is dissolved and cool before using. Leftover sugar syrup can be kept in the fridge and used for other mocktails. Note 2: If you haven’t got a a juicer for the pomegranate juice, just whizz the seeds in a food processor then strain out juice.